Custom printed table cloths table cloths are the perfect addition to any exhibition display. They are a low-cost solution which enables you to prominently market your brand without breaking your budget. Finishing touches are what can make or break an exhibition display, and a printed table cloth creates a finished and professional appearance as well as improve the overall look of your stand. There are many benefits to a branded tablecloth, here are just some of the reasons why your brand needs a custom printed table cloth. Our custom printed tablecloths are available in a range of different sizes and colour options. We offer two standard sized table cloths – 5ft and 6ft table cloths. The 5ft Tablecloth is 2780mm x 1780mm and is designed to fit a 4/5ft Table. Our 6ft Tablecloth is 3280mm x 1780mm and is designed to fit a 6/7ft table. Our Printed Table Runners are 2000mm x 1000mm. However, if these sizes do not fit your needs, we can offer bespoke sizes – just call us on 01733 511030 for a quote. You can also choose to have a full printed table cloth or a logo table cloth with one logo printed on the front. The logo table cloth is just £52 for a 5ft, and £62 for 6ft tablecloth. Our logo tablecloths create a professional finish with excellent brand placement, ideal for any event where you require a branded presence. The Fully Printed Tablecloths offer unlimited artwork options. With edge to edge printing, they offer maximum brand exposure. Full print means just that, full print – the custom table cloth is printed all over with your artwork, image or design. This provides unlimited design potential with the only restriction being the size of the cloth! You can print one large image, have a design all over or have a step-repeat pattern of your logo. We also offer our plain 5ft and 6ft Conference Cloths. These plain tablecloths are available in just 24hours and can be used for unbranded events and are also suitable for use with our printed table runners, to create a branded table display. The logo tablecloth is manufactured from a UK woven, 220g Polyester quality cloth with a brushed Cotton, luxurious finish. Fully hemmed and overlocked to ensure a high-quality product which improves the drape, finish and feel of the tablecloth. The linen fabric has anti-stain, anti-crease and colour fast inhibitors fused within the weave of the fabric and has been developed to look great even after repeated washes. Our full print tablecloths are printed in full colour to an excellent standard. The cloth is printed using the latest dye-sublimation printing process. This is a process where heat and pressure are used to transfer dye into fabric resulting in permanent, high-resolution print which will not crack, fade or peel. It produces exceptional detail and colour quality. Manufactured using a 215gsm display polyester with a satin sheen finish and fully hemmed to ensure a neat and professional finish. Our tablecloths are extremely versatile and can be used for almost any event from exhibitions to trade shows and conferences, from sporting events to motor shows, craft fairs to community events. Also ideal for use at school open days, wedding fairs, business meetings and art exhibitions – more or less anywhere you have a table that requires dressing. Our exhibition cloths are machine washable at 40°. 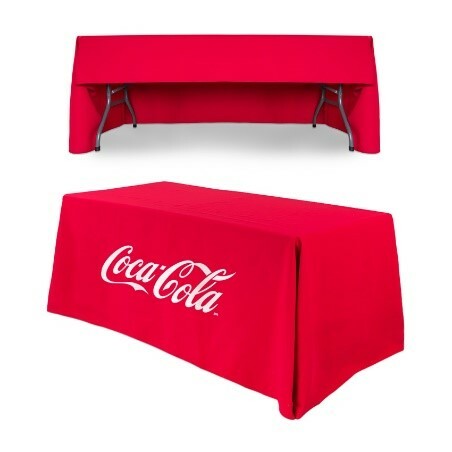 This allows you to wash your tablecloth after use to maintain a professional and clean appearance for every event. 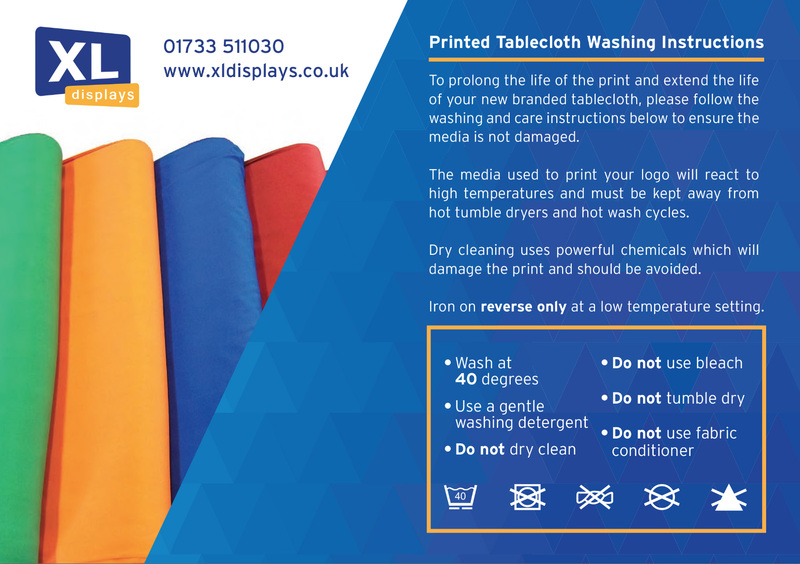 We include a guide on how to care for your table cloth with every cloth we dispatch. We pride ourselves on being able to deliver high-quality products at competitive prices in a fast turnaround, without compromising on quality. Our logo tablecloths are dispatched with 48 hours of receiving approved artwork. We dispatch on a next day courier service which is fully trackable. Our full print tablecloths are dispatched within 3-5 days and our plain conference cloths are dispatched the same day on a next day delivery service if ordered before 2 pm. We offer complete transparency of our service with step by step reassurance that your order is being dealt with, and processed within the time frame advised. We also call to confirm you have received your order, ensuring your 100% satisfied with your delivered product. See what our customers think, we have 100’s of genuine customer reviews on our printed tablecloths alone. We offer a free logo placement and artwork check to ensure the finished product is exactly what you are expecting, and we have no minimum order charge. Our prices are the same great prices even if you order one tablecloth. Our price match promise means we will match a lower price for a genuine like-for-like product – if you find the same product cheaper elsewhere contact us and we’ll beat the price. Our custom printed table cloths are great value and will add the finishing touch to your event display. Lightweight and easy to transport they are one of the most affordable, useful and portable exhibition displays solutions on the market. For more information about our Printed Table Cloths or Pop Up Stands and Pull Up Banners please contact us or call our sales team on 01733 511030.